No Man’s Sky is about to launch on Xbox One (with 4K and HDR support on Xbox One X), packed with the NEXT update that’s set to deliver proper multiplayer functionality on all platforms. Ahead of the upcoming release, publisher 505 Games and developer Hello Games have shared a new trailer with the eleven things that have been improved the most since No Man’s Sky first launched in August 2016, almost two years ago, for PC and PlayStation 4. Hello Games got heavily criticized at launch due to many advertised features being unavailable, but that’s been slowly and surely fixed over the course of a few free updates. Hello everyone – it’s an exciting and super busy month for Hello Games and No Man’s Sky as we have our massive NEXT update launching across all platforms on July 24, and for the first time on Xbox One! We will be sharing more details about the new content in the run-up to launch. 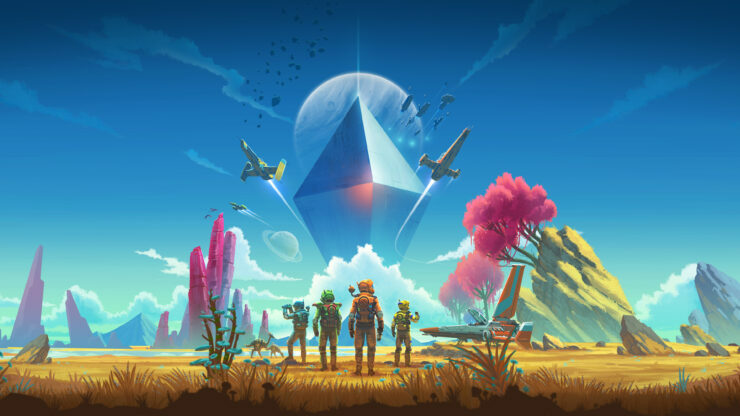 But a question we get asked all the time is ‘what’s changed in No Man’s Sky?’, so our friends at 505 Games have made a handy vid “11 Things That Have Changed in No Man’s Sky Since Launch” to remind everybody about the many many things that have changed… since launch. Changes we’ve highlighted include a regenerated universe, newly opened portal stargates, new biomes, deeper trading, exocraft for advanced exploration, new modes (Survival / Permadeath / Creative), base building, new missions/story, terrain manipulation, crashed / interstellar freighters, and deeper space combat.